Dr. Benjamin Baker is well known for his sound wisdom and God-centered teaching, as well as his witty one-liners that challenge listeners. Now his sayings are gathered in one place so readers can ponder each one’s deeper meaning. 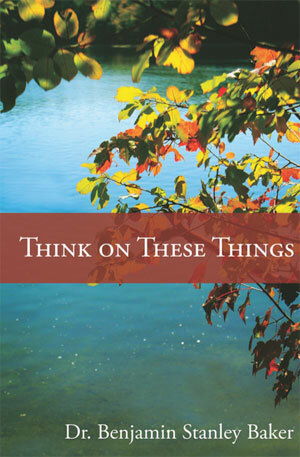 Think on These Things features 98 of Baker’s favorite aphorisms, with a short paragraph that dives deeper into each one to reveal important spiritual lessons. Read one at a time or several a day to glean God-centered insight into living the Christian life. Dr. Benjamin Stanley Baker is a teacher, pastor, and professor. He has more than 50 years of pastoral experience and is currently Pastor at The Church of Abundant Life, Southfield, Michigan. He has authored 15 books including The Battle is the Lord’s, Having a Mind to Do the Lord’s Work, Shepherding the Sheep, 40 days of Wisdom for Women, 40 Days of Wisdom for Men, and Standing in the Need of Prayer. Dr. Baker and his wife Carol have four children and four grandchildren.